Libya in the long term will need a diversified economy away from oil and gas. One way to do this is to support innovative and mostly technology-backed startup ideas to succeed and grow. In Libya, such startups, currently are few and far between. Enablers – Places to work and availability of data/information etc. Libyan startups contend with a relatively very small population in Libya of 6-7 million compared to for example 98 million in Egypt. Israel a very successful nation with one of the most innovative economies in the world also contend with a small population of 8.7 million but their solution has always been to look outwards towards mostly the European and US markets amongst others. Attain funding to take model to expand to other major cities in MENA or Africa. If it is an international product or service, they need to develop the prototype, identify the business model and then move to step 7 thinking internationally. What is important for a startup to rapidly grow is access to finance. Investing in startups is not the same as providing financing to a well-established company with a track record or even to what can be deemed as a traditional SME – for example in well-known manufacturing and service sectors; investing in startups is investing in potential of high growth. Usually financial returns are not as fast as profit generation can take longer but the reward can be the exponential growth of the value of the startup. Innovative startups that can start by having just a small team and an innovative product/service (usually backed by technology) can quickly grow to reach a large number of people, in a very short of time. If Libyan entrepreneurs can think of local solutions and succeed in two or three Libyan cities there is no reason why they can’t quickly move to a neighbouring international market and expand if the idea has not been seized in other markets too. If 5 years ago Libya had the capacity to encourage the growth of startups, potentially there could have been startups today that had an innovative idea that could be ready to expand into other markets. The MENA and Africa markets are booming and are only starting to be grasped. The Libyan mind is no different to any other mind, the only difference is the environment they are in and for startups, the entrepreneurial ecosystem. The challenge is as local startups turn to national and regional players, more international competitors come in with sometimes larger sources of capital. Take for example the startup in Egypt: Swvl. The startup provides users with local buses and mini-buses in Egyptian neighbourhoods. They were founded only recently in April 2017, with a starting $500,000 seed investment. In April this year, 2018 – after just one year – they received an $8 million round funding from Careem. This is regarded as the biggest single Series A/B Startup investment in Egypt to date after the $6.6 million investment into Vezeeta (health care booking app) back in January 2017 (which later was further backed by a Saudi-Arabian backed series C investment for approx. $12 million). Careem is a taxi service. It launched in 2012 from Dubai and operate in Egypt amongst 100 other cities. The first round of funding raised $1.7 million in 2013. This is relatively peanuts money, for a service that is deemed to be worth now over $1.5- $2 billion. In December 2016 it received a $350 million, followed by a $200 million round of funding last October 2018. Swvl have been working for a year in Egypt. Careem has been around since 2012 in Egypt. As they both succeed in what is relatively a tough market, international players and financiers see the potentials of the market and enter. In this example Uber entered the Egyptian market in 2014 and has quickly been able to take a large market share away from Careem. They were able to do this very quickly as they have models of operating in other countries and simply tailored their services for the Egyptian market. Pus: cash, they invested heavily in Egypt. Then as Swvl has started to succeed, Uber moved quickly too. They created Uber Bus – a direct competitor to Swvl. The Egyptian founders will have to keep moving quick to be able to compete against the new contender Uber Bus. The idea is to move fast. To be the first mover so that if (and when) a competitor enters that they already enter too late even if they have higher access capital to invest. 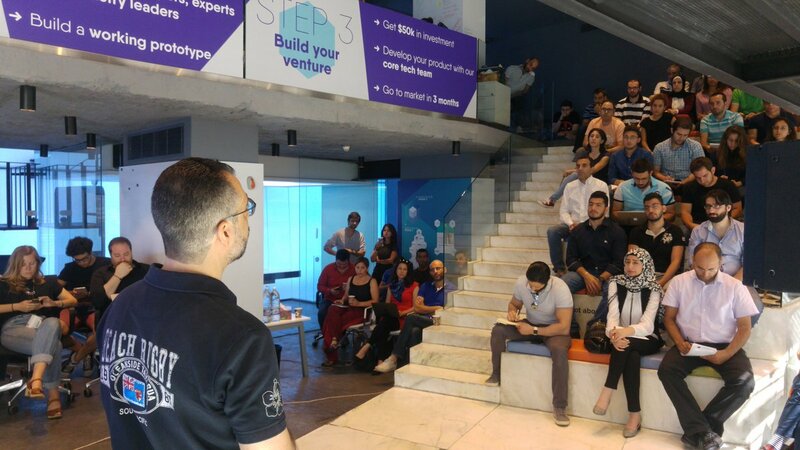 Egypt is exciting because of its large population means nationwide growth can be quick and most importantly between Egypt and Dubai we are starting to see an increasing amount of startup funding available. Traditionally MENA based financiers invested in well-established business models and real estate. There is a general trend now where financiers are seeing the potentials of sometimes young, quirky startup teams and their big ideas. It cannot be underestimated how important it is for a successful ecosystem to thrive that there is a readily available sources of startup funding. If there is no relevant ecosystem in Libya, then a solution must be to be ready to tap into other ecosystems in the region and allow these business ideas to grow. This can be done by connecting to regional ecosystems such as for example those in Egypt, Jordan or Dubai. An alternative is to go from a European base as some regional initiatives have done (such as UK Lebanon Tech Hub – http://www.uklebhub.com). An ecosystem provides two vastly important items for startups on their rapid growth path: access to skilled workforce and access to finance. The staff take the plans of the founders and use their technical skills to make it happen. These types of staff can usually be found around successful universities. Access to finance is needed to be able to deploy fast and grow. Without this finance, other competitors will come in and take market share. Many startup ideas in the region aim to solve problems in a specific city or country which can actually be found in neighbouring countries too. Without expansion into neighbouring countries in the long-term, Libyan startups can only grow a limited size.